Statistician Nathan Yau of Flowing Data has compiled a beautiful and revealing infographic showing the 50 most common family structures in the United States. 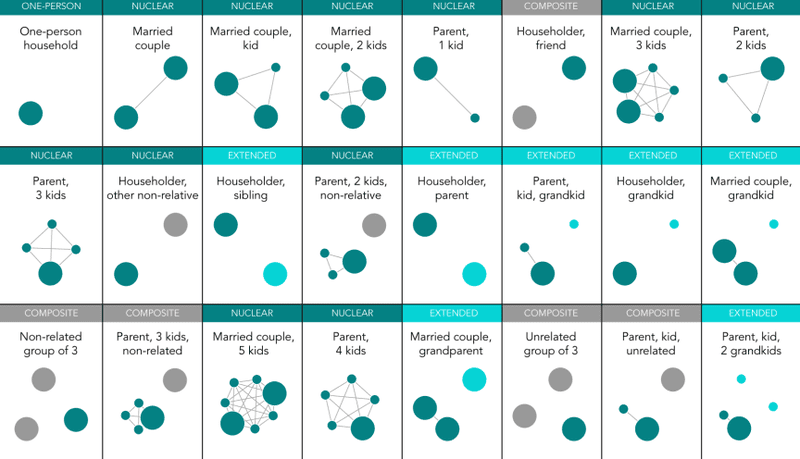 As this clever visualization shows, the nuclear family—though the most common—is far from the only one. To create this infographic, Yau took data from the five-year American Community Survey (2009-2014), and manually tallied-up 10,276 different types of households. The chart below shows the top 50, which represents 94 percent of all household types in the United States. Yau divided the results into three broad categories: nuclear, composite, and extended. Relationships are shown relative to the surveyed head of the household. Larger circles represent older adults, while smaller circles represent children and grandchildren. Dark green shows direct family members, light green shows extended family, and grey shows non-related, non-married individuals. Of the total, 54 percent represent so-called nuclear families. As Yau aptly observes, “that leaves 46 percent of households that are not nuclear, and that seems worth looking into more deeply.” Also, 10,226 household types were not represented in the chart, and they’re also deserving of a deeper dive. An interesting aspect of this chart is that some members of the households surveyed would not identify themselves as being part of a “family.” Take the composite household, “Unrelated group of three.” That just sounds like three room mates. Or, it could be a polyamorous trio. Hard to know. Regardless, it’s clear that households and families—however you define them—are more complicated than we typically think, and they’re rapidly changing.